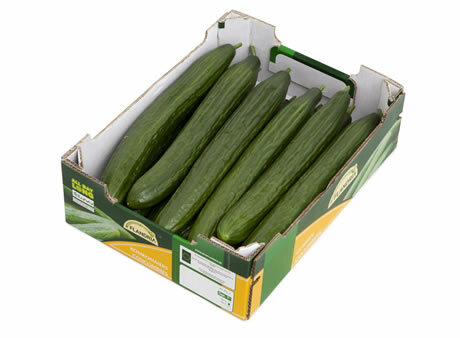 On Monday, 21 January, the first Belgian cucumbers of the new growing season were sold at the REO Auction. REO producers Jasper Haghedooren from Westrozebeke and Nico Perneel from Oostnieuwkerke were, just like last year, the first suppliers that delivered. This fruit vegetable is becoming an increasingly important product at the REO Auction. "Thanks to the focus on quality and service, the REO Auction and its cucumber growers are increasingly making the difference with this product on the domestic market. The REO Auction sold 38.7 million Belgian cucumbers last year compared to 11.5 million units in 2008. A tripling in ten years! With this, West Flanders is the largest Belgian production region for cucumbers. The supply is highest from May to September. This year we expect a similar supply as last year," says Martine Ingels, product manager at the REO Auction.